To soften the edges and make the character of Charlie Kenton more likable, Gatins had to re-write certain scenes. “There’s a scene where the kid actually does, early on, when he’s like give me the money and I’ll get out of here. That’s a scene we actually shot where he runs away,” Gatins told us. Real Steel is a fairly long movie, so certain scenes that Gatins and director Shawn Levy became attached to unfortunately had to be cut from the film. “there was a whole kind of origin story of Max, you learn more about his mom. And there was this whole thing about this butterfly…” Gatins said. “It’s a great scene but the scene never quite played right.” Don Murphy said. Gatins, Murphy, and Montford reminisced about the deleted butterfly scene, but have hope that it will appear in the deleted scenes on the DVD release. We also asked if they had ever considered ending the final battle differently. “No…Susan and I are very hopeful for a sequel,” said Don Murphy. The character Bailey (Evangeline Lily) was originally going to be written for a male. Steven Spielberg wanted Bailey to be played by a woman instead. An older child actor was originally cast to play Max Kenton, and footage was actually shot with him. Steven Spielberg informed them that he thought they should go younger, and a world wide casting search found them Dakota Goyo. 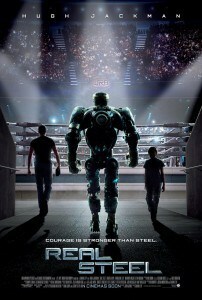 A sequel to Real Steel will explore Atom’s origins. I thought it was a great movie! Both my husband and I really enjoyed it.